Includes contributions from Pat Boyette, Ernie Colon and Tom Sutton. 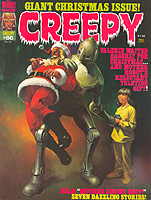 Includes contributions from Pat Boyette, Frank Brunner and Dave Cockrum. 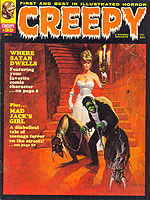 Includes contributions from Richard Corben, Sanjulian and Ramon Torrents. 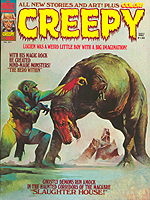 Includes contributions from Richard Corben, Gonzalo Mayo and Sanjulian. and Magazine is Very Fine Plus. 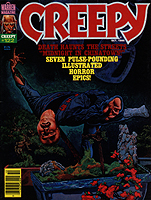 Includes contributions from Vaughn Bodé, Richard Corben and Berni Wrightson. 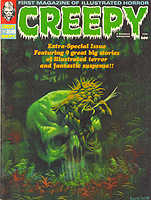 Includes contributions from Richard Corben, Ken Kelly and Berni Wrightson. 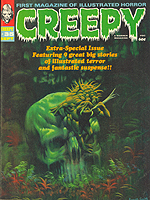 Includes contributions from Richard Corben, Frank Frazetta and Berni Wrightson. 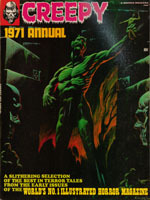 Signed on the cover by writer Bruce Jones. Includes contributions from Leo Duranona, Carmine Infantino and Walt Simonson. 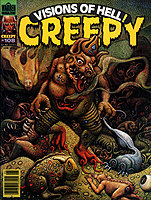 Includes contributions from Ken Kelly, Gonzalo Mayo, John Severin and Berni Wrightson. 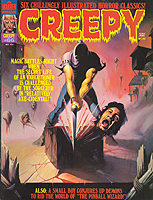 Includes contributions from Steve Hickman, Bruce Jones, Esteban Maroto and Ramon Torrents. 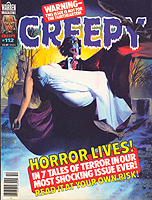 Includes contributions from Richard Corben, Jeffrey Jones and Berni Wrightson. Note: Personally signed by Berni Wrightson on the interior. Includes contributions from Jim Starlin, Pablo Marcos, Moreno Casares and Joe Rubenstein. 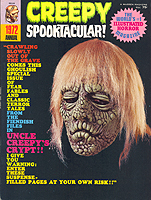 Includes contributions from Pablo Marcos, Alex Nino and Val Mayerick. 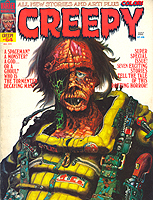 Includes contributions from Patrick Woodroffe, Rudy Nebres and Nicola Cuti. 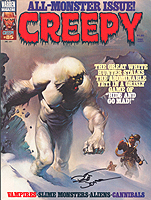 Includes contributions from Richard Corben, Alex Nino, Walt Simonson and Al Williamson. 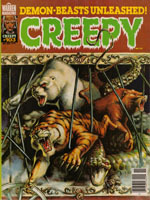 Includes contributions from Mike Zeck, Val Mayerick, Alfredo Alcala and Leo Duranona. Includes contributions from Richard Courtney, Carmine Infantino, Gonzalo Mayo and Joe Staton. 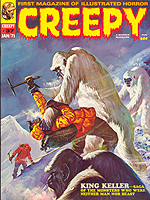 Includes contributions from Neal Adams, Pat Boyette and Steve Ditko. Includes contributions from T. Casey Brennan, Reed Crandall and Tom Sutton.